Being unfamiliar with scuba diving does not really prevent you from admiring all that Caraga has to offer under the water if one looks at all its endless coastlines, countless islands, islets and shoals. Surfing in Siargao became such a phenomenon that there is one more product that perhaps we did not seriously take a look at because we were all focused on what was on the surface-surfing and island-hopping. 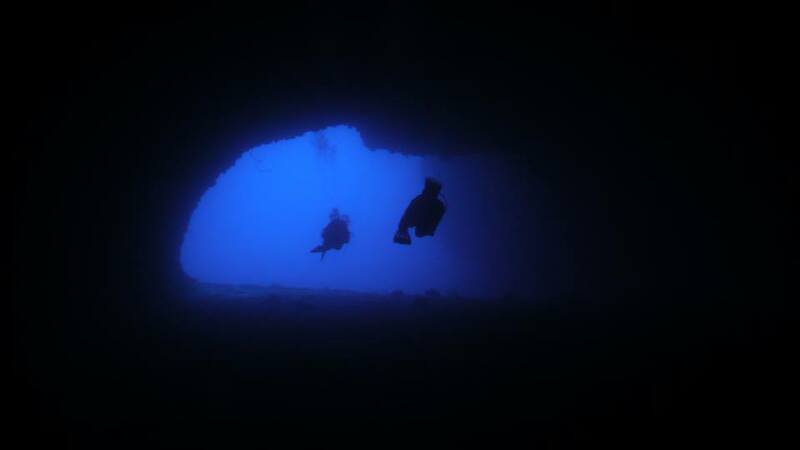 In Siargao, there is the majestic wonder called the Blue Cathedral, an underwater rock formation with a vertical hole. Blue Cathedral’s top is a 20-meter diameter hole at a depth of 20 meters. Then as you descend into it there’s a sliding slope that leads to its two caverns-the North and East caverns. On the north cavern you will see a jagged rock that has split off from the top ceiling (Sword of Gabriel), going into this hole will lead you to 10 meter high and 30-meter long cavern (at average depth of 30 meters) that will spill you North into the Pacific waters. On the east cavern is the other cavern Devil’s Pipeline (15 meter high and 40 meter long tunnel), shaped more like a Cloud 9 pipeline than a cavern. You need a good light here to appreciate the tunnel’s grand design. At the end of Devil’s Pipeline is the Arm of God (30 meter long rock perched on three columns that reach out East to the Pacific), as there are spaces between the columns you will tend to see blue-lit water out of those spaces. We call these spaces the Eyes of God. What a wonderful new gift the Lord Almighty has given to Siargao. Out of Blue Cathedral is the lip of the Siargao shelf meeting the blue Pacific waters. The terminal depth of 50 meters goes on for several kilometres, and on any given day you can see the bottom. Diving here is not for the faint-hearted. It is also not predictable like any house reef dive. Like Cloud 9, the Blue Cathedral faces the Pacific Ocean. Like a surfer waiting for swells, a diver must carefully plan for a break in the current to come in the hole. This ‘holy’ dive site just sits in front of the Cloud 9 pavilion where from your boat you will still get a ‘heavenly’ glimpse of the surfers riding the waves. Indeed you are in surfing and diving heaven.